Nothing signals the start of the new gardening season in Norway more than the Hagemessen, Norway’s largest garden show that takes place at the end of April each year. It is one big celebration of all things gardening in Norway. This year, after a long snowy winter, you certainly got a sense that everyone was keen to waste no time in embracing the spring season. The show seemed busier than ever with 20 000 visitors over three days. Across 250 stalls there was everything from tools and accessories, greenhouses, outdoor furniture to plants and bulbs. There was also a lively programme of speakers and workshops covering topics such as bokashi composting, balcony gardening and kitchen gardens. I attended the very informative talk by Honorata Kaja Gajda from the Norsk Botanisk Forening. She outlined some ornamental plants that had been introduced commercially in the past that are now on a blacklist/ ‘svartelist’ in Norway. This is because over time they have been shown to be a high risk to the natural diversity of the landscape. What this reminds me, if nothing else, is that there is a value in looking beyond the obvious and to seek out less common varieties. I will fully admit I love the freedom of using a wide diversity of plants in planting schemes, to be fully expressive in colour and texture. However, all too often we don’t see the thing that stares us in the face, the plant that helps give that place it’s unique sense of place. And, with a bit of creativity, that can lend a planting scheme meaning and real connection to the environment beyond the garden boundary. All in all, it was very encouraging to see a lot of enthusiastic people turn up to this event. I think it, alongside prime time T.V shows that are starting to emerge, is helping to raise awareness of gardening and of growing food. Gardening is continuing to grow in Norway and that’s really positive. Categories: Gardening in Oslo | Tags: Hagemessen, Norsk Botanisk Forening, svarteliste | Permalink. I’m pleased to be back to gardening after an extended absence. My last blog entry, way back in July 2016, was written just as I and the family were making preparations to move house, with all the craziness that moving entails. I had barely got settled into our new home before I swapped my gardening tools for pens and pencils and embarked on a year-long study course in Garden Design at the Inchbald School of Design in London. Returning to study was a daunting but also a thrilling prospect. Over the year, we explored art and themes like aesthetics, garden design history, design principles and plant design. We developed skills in technical drawing and construction detail drawing. We kept sketchbooks to strengthen our hand drawing and to record our creative visual process. Our heads were crammed full of latin plant names and we scrutinised every paving stone and brick like never before! The whole experience turned out to be challenging but totally exhilarating. A selection of my drawings and photos from 2016/2017 course. Happily, in the summer of 2017, I graduated- yippeeee!!! – but then promptly followed it with an extended period away from all garden-related things to recharge! Over this last winter, I gradually began taking steps to establish a business here (psst, here’s my website if you are interested). As time goes on, I’ll continue to share my gardening adventures here on my blog and hope you can join me too! Categories: Gardening in Oslo | Tags: Diploma, garden design, Inchbald | Permalink. A combination of lots of travel to the UK and preparations to move house has meant that gardening has taken a back seat over the past four weeks. I’ve probably spent no more than 2-3 hours gardening and that’s included the work on the school garden. By and large, I think I’ve got away with it. But I don’t think I can really take the credit. As June moved into July, weather shifted from being endlessly warm and dry to being warm and wet so that, without any effort from me, my plants received a regular dousing of their most basic requirement every few days. I’ve used any opportunity I’ve had just to get the necessary done and I’ve not had much time to potter and finesse. Here is a retrospective of what’s been happening in my garden over the past month. Against a backdrop of lush growth, the Clematis, Lonicera and Geranium Rozanne provided the main colour- lots of pinks, purples and peach. I worked in some of my banana fertiliser in the hope it would prolong the flowers and encourage more. The flowers of the climbers tumbled down in a mass for the simple reason that I never got around to making a climbing frame for either before it was too late. I think the Lonicera probably would have done better without having so much of the Clematis clambering over it but, all in all, I rather like the effect. Geranium Rozanne is flowering reliably and profusely. I intend to divide this at the end of the season so that I can spread it around a bit. The Lamprocapnos and Geranium macrorrhizum came and went, the Geranium overlapping the Lamprocapnos. Foliage of the Lamprocapnos is now slowly turning yellow and when it dies back further, I’ll cut it right back to rejuvenate it. Some of the Geranium’s leaves are changing colour now and seed pods have formed. 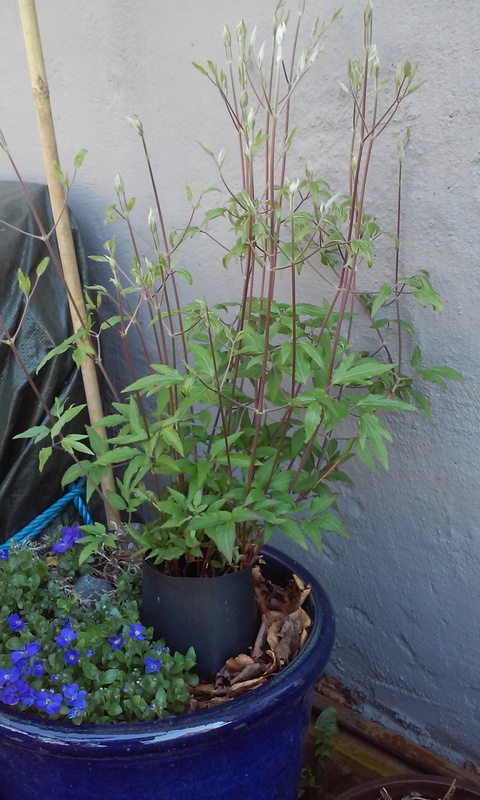 The Salvia, that originally had been sharing a pot with the Geranium but had become overwhelmed by it, was relocated to a new pot alongside the more sedate clump forming Geranium sanguineum that itself had originally been pot-mates with the Coreopsis grandiflora. In this new arrangement they are both much happier and I like the combination of shapes and colour. The Coreopsis, seemingly on death’s door earlier in the season and destined for the compost heap, has produced new lush green growth and may even flower later on in the summer if I’m lucky. The Aquilegia, sown from seed last year has produced flowers for the first time and I’ve been able to collect seeds. Seedlings of annuals that were sown -Cosmos, Zinnia, Helianthus and Antirrhinum- were potted on. The Antirrhinums still have a way to go before they flower even though I sowed them much earlier than last year. Last year’s plants never got fully going before the frosts so I am hoping there’ll be a decent display this year. One Cosmos has flowered but, in what seemed drastic at the time, I cut back foliage hard (about two-thirds) from the other three cosmos seedlings. In only two weeks, the foliage grew back more bushy and there are lots of buds, so even though flowers have been delayed I’m expecting to enjoy many more as a result. Likewise early on, the two zinnias produced a single flower each but I deadheaded them and now more stems with buds have appeared. The two Helianthus ‘Velvet Queen’ (shown tall at the back of picture 3) are growing strongly and hopefully will also add some late season colour. As far as the home-grown food this year, it’s been a mixed bag. Strawberries have produced lots of tasty fruit but I’m disappointed to have missed a few, so I’m netting them from now on. I left it late to pot on chard and beetroot seedlings and somewhere in the process have lost the label. I think I’ve sussed out which is which but time will soon tell! I finally potted up the Fennel seedlings. I just put them into the largest pot I had (about 30cm deep) which is shallower than ideal, and spaced closer together which will mean the bulbs won’t end up being so big but that’s just the reality of growing in small spaces. Hopefully the taste will more than make up for the size. My peas are doing well against my rudimentary bamboo and willow climbing frames. From two containers I’d say I’ve picked two healthy portions of peas so far, and more are on their way. The broad beans are still forming pods but have flowered well and are growing healthily. As an experiment I scatter-sowed some carrots and radishes in a tall pot and the results have been a bit of a let down. The carrots were deluged by the radishes, which became all leaf and no root. Photos show before and after removal of the radishes. Surprisingly the carrots didn’t seem to have been adversely affected. So I decided to leave them as is and not thin them out, preferring to let them develop a bit before I harvest some baby carrots and then harvest the carrots that remain right at the end of the season. The three varieties of lettuce have grown fantastically well, kept in semi-shade, and have provided some lovely combinations of tasty salads. They also look great together so definitely one to repeat next year. The summer squash is potted up and even though there are flowers, no fruit is forming yet. The mystery of the fruit bush is now solved: it’s Aronia, which is a prolific fruiter, and claims to be very high in antioxidants. I still need to pot it as a priority to give it the best opportunity to develop its juicy berries. Finally, my tomatoes. 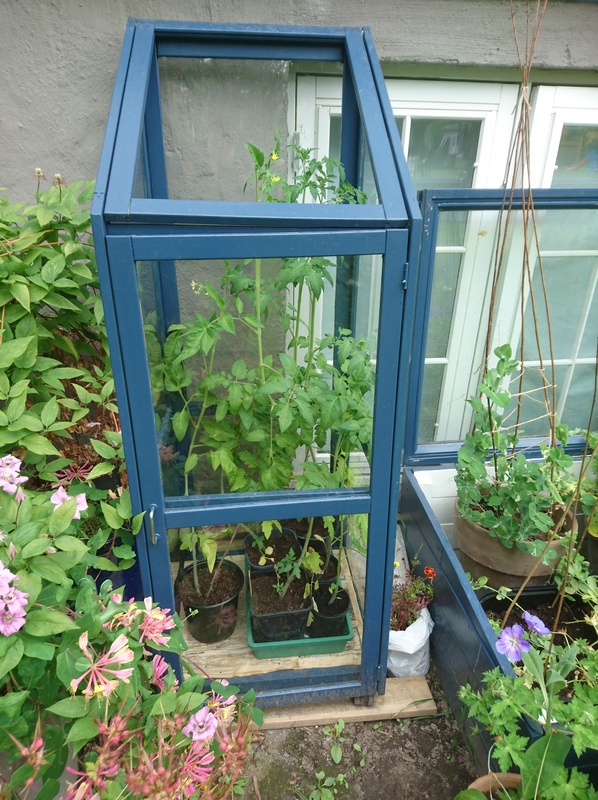 I reclaimed a glass cabinet and upcycled it to match my cold frame. It’s been perfect for this year’s tomatoes. A few flowers are already forming. I’m crossing my fingers for warm weather long enough for them to form into some fruit and I’ve added some tomato fertiliser to help them along. One of my next jobs is to repot them and string them up. 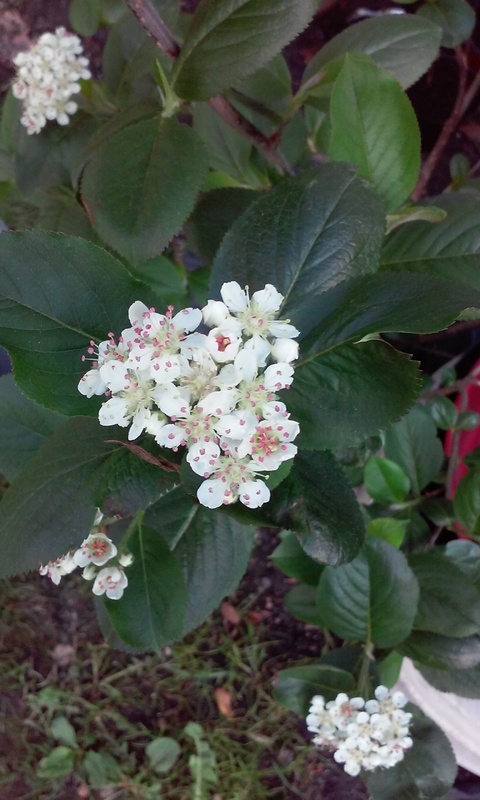 Categories: Gardening in Oslo | Tags: Aronia | Permalink. The air is alive with the sounds and smells of late spring- early summer. Birds chatter, insects buzz. Bright days follow rain showers that leave everything looking lush and intensify the intoxicating scent of Syringa, apple blossom and Spiraea, to name but a few. Days are longer with nights that never quite get dark and a dawn chorus that starts from about 2am! It’s hard to keep up with what’s happening in the garden. So far it’s a good year for the strawberries in the trough. 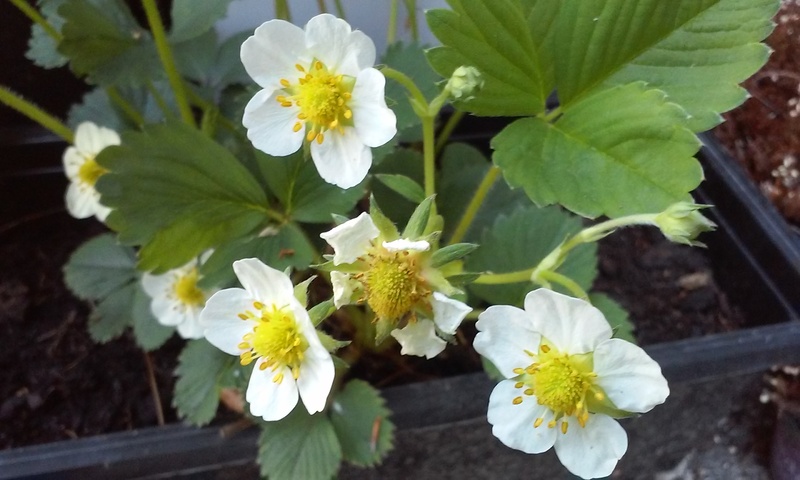 Compared to this time last year the strawberries seem much healthier and are producing lots of flowers that promise lots of juicy fruits later this summer. As soon as they begin to send out runners I’ll cut them back so the plants can focus on fruit production. Apparently strawberries can be good companion plants to bush beans, lettuce, onion, spinach and thyme. So since I’ve got a few odd lettuce seedlings left to transplant, I’ve filled a couple of gaps in the container to see how they get on. One of the earliest plants to flower is the Lamprocapnos spectabilis. Now in its second year with me, it is looking much happier than it did last year and it has produced some lovely delicate pink flowers. It’s in a pot on its own so I can keep it especially moist in dryer spells. It sits alongside the Geranium whose own pink flower buds are waiting in the wings. Two other plants that definitely look better second year in are the Comfrey and Aquilegia. The Comfrey has just started to open its purple bell-like flowers. The Aquilegia next to it that I bought as a unidentifiable small clump at an end of season sale suffered from powdery mildew last year but this year has emerged from winter much more invigorated. Buds have formed so I can’t wait to see what the flowers are like. The long winters here do seem to be helpful when rejuvenating plants that may ordinarily be plagued with diseases over a longer period. The salads I’ve been growing have been enjoying the temperatures (12-19 degrees C) and rain we’ve been having lately. The Red Giant leaf, true to its name with its incredible foliage, looks fantastic. Its leaves also prove to be tasty, with a wonderful spicy mustard flavour. These are the very same ones that emerged as tiny plants from the winter so I’m very happy with how things have turned out. I expect it won’t be long now before they go to seed as temperatures rise, so I’m making the most of them while I can. Lettuce and watercress that I sowed in mid April are coming along well. It’s time to feed the watercress some liquid feed, so I use some of the home-made nettle feed that I made last year that has been maturing in a sealed bucket ever since. Some of the kale and cabbage are now ready to plant out at the school garden this week. The chard, in contrast, has suffered a bit from damping off this year. So this week I’ll go through the seedlings and rescue the strongest ones to pot on and probably end up sowing some chard seeds directly into the raised beds as well. The Helianthus seedlings (shown here in front of a pot with carrot and radish seeds I’ve just sown) have just been potted on and will be transplanted into the school garden in a week or two. The Lathyrus odoratus and Cosmos bipinnatus seedlings are really overdue for planting out. Both need supports: for the Sweet peas something to climb on and for the Cosmos to keep the stems upright, essential if I want to use it as a cutting flower. At the beginning of May I sowed another batch of broad beans and peas in root trainers outside (keeping the lid on to maintain high humidity until they germinated, and thereafter initially just at night times). They’ll be ready to transplant into my tubs once they’re a bit more bushy, which shouldn’t be too long if they keep growing at this rate. The squash could do with being re-potted or transplanted but are being stretched out as they are in the cold frame for a little while longer. Last year the squash weren’t a success at the school garden which may have been, in part, because they were planted out too young and subsequently weren’t able to deal with the weather that turned windy and rainy. Though I’m not sure whether larger plants would have particularly relished that forecast either to be honest. The fennel is outgrowing its pot and should be planted out this week which, along with the mysterious fruit bush, needs a deep container- still looking! In the meantime, the fruit bush is flowering. I’m still none the wiser as to the species but I guess time will tell. Categories: Gardening in Oslo, Monthly garden updates | Tags: hardening off, spring | Permalink. Today is Norway’s National Day. It celebrates the creation of Norway’s constitution in 1814. It is a big deal and is celebrated seriously but it is a whole load of fun. People dress up to the nines in their national costume (each regional costume will have its own colour or pattern of embroidery), there are local parades with children and marching bands as well as street and garden parties. The days running up to the day must be the busiest in the garden centres…! This year I couldn’t fail to be impressed with how the parliament building in Oslo had been decorated. At first glance I didn’t realise that the patterns on the building were actually made with flowers, planted up and somehow suspended from its walls, creating a really fun 3D effect. A nice innovative take on vertical planting. So I thought I’d share it with you, and wish you ‘Gratulerer med dagen’ (‘congratulations with the day’) as they say here! Categories: Gardening in Oslo | Tags: vertical planting | Permalink. It’s still early days at the school garden. I’ve only made three visits so far, not falling into the trap I did last year of being so eager to plant out some vegetables it ended up being too soon and the cold weather took its toll on them. The chives that I overwintered have been transplanted alongside the rows of carrots. These plants are now in their second year, looking nice and healthy so I’m hoping I’ll see some lovely flowers from them this summer. What I’ve sown/planted and where is according to my school plan but I’m already thinking I might amend it slightly. I may move the lettuces over to the area underneath the Uchiki kuri squash’s climbing frame. I recently saw pictures of this idea and it seemed an effective use of what would otherwise be dead space. Plus it means that in the space that’s freed up I can grow some more beans and peas and possibly, if there’s room, another summer squash. By the time of my third visit, the lettuces and calendula were beginning to emerge. Between the visits, the soil temperature in the raised beds had increased from (barely) 5 to 7 to 12 degrees celsius. I’m keeping the remaining beds covered for now and will be back soon to transplant some of the vegetable and flower seedlings currently hardening off at home. Categories: Food growing, Raised beds | Tags: Raised beds, sowing | Permalink. A burst of warm spring weather has got the plants romping full steam ahead leaving me trying to play catch up. Here’s a summary of what’s what, and all the jobs I’ve been busy with. My windowsills had become jammed packed full of seedlings and a few days ago I decided to transfer as many as possible into the cold frame. To make some room I took out lettuce, beans and peas that I’d sowed at the end of March/beginning of April. They had been hardening off gradually in the cold frame, but as it’s been so warm, I took a chance and moved them outside. I added a light protective layer for the first few nights and gradually got them used to the sun but essentially they’ve been out all the time. I pricked out the little lettuce seedlings and replanted them in one of the large tubs outside the cold frame, planting them close together as they’ll be grown as a cut and come again crop. Either side of the lettuce tub, are the salads I over-wintered. There’s a tub of Lambs Lettuce that managed to survive the winter outside and a tub of Red Giant Mustard (Asian) salad that was sown at the same time but never made it outdoors until I transferred it out in early April. In the Red Giant tub there are signs of some more quick-growing lettuces that I have sown recently to fill the gaps. The Watercress seeds I sowed in mid April inside the cold frame have now germinated but I haven’t moved them outside. So they’ll stay inside for the time being, permanently sitting in water, keeping nice and moist (top right). 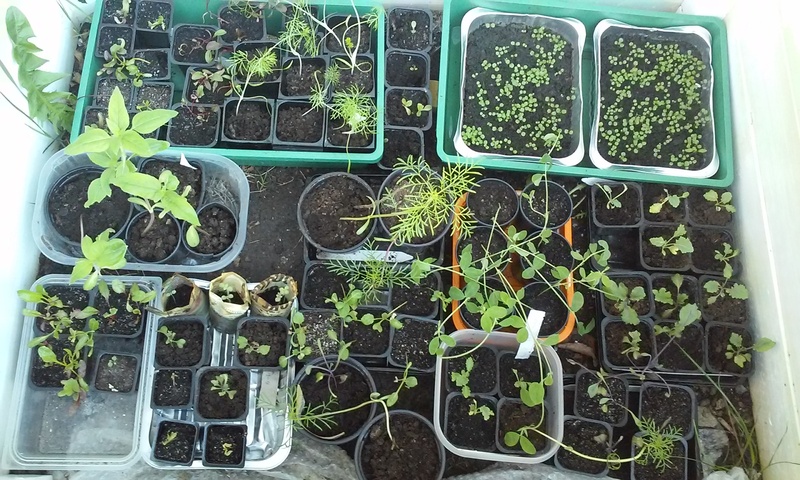 I’ve started potting on some seedlings, such as the Helianthus annuus, Cosmos bipinnatus, Fennel and Kale but more need to be done over the coming weeks. Many seedlings have grown a little leggy, and some are still very small, particularly the beetroot. The warm and dry conditions inside the house won’t have been good for them, so I’m hoping they’ll improve in time in their new positions. Now that the beans and peas that I sowed earlier in the cold frame were doing well, I couldn’t help sowing another batch, to get another crop later in the summer. Here they are side by side. When sowing the new ones I’ve used a multi purpose compost rather than a seedling compost in order to provide them with a bit more sustenance as they develop over time. In the area outside, the plants have really picked up the pace of growth over the last month. The Lamprocapnos spectabilis (top right) has shot up and little pink flower buds have already begun to appear, being one of the earliest to bloom. In the oblong planter, the dwarf Astilbe, Geranium Rozanne and Corydalis are doing well. I thought I’d lost the Geranium but it’s popped up again. I’m finally hoping to see some blue Corydalis flowers this year; it’s not flowered in the 2 years I’ve had it! The Coreopsis grandiflora is still a mass of dry stalks and by now has usually shown some signs of some new growth. I’ll wait a while longer before I take any drastic action, as it may just be late developing this year. The Geranium macrorrhizum in the large round pot is already running riot and had already overshadowed the Salvia nemorosa. So I’ve put the Salvia in with the smaller mound-forming Geranium sanguineum that had been growing with the Coreopsis. Its new pot sits on the bench (shown below) alongside the Aquilegia vulgaris, and the re-potted Comfrey and Euphorbia epithymoides. Below them is the long planter of strawberries, that I will continue to propagate this year. I am a bit late erecting a climbing frame around the Clematis, which is just romping away. This is one of my next jobs to do. The Aubrieta at the base of the clematis, whose beautiful deep violet flowers were just beginning to form a few weeks ago (picture left), is now blossoming. I gave it quite a hard cut back in the autumn to rejuvinate it and it seems to have resonded well. I have done well to resist the charms of new plants at the local garden centre up to now but it seems a plant has sought me out…..A wooden planter was being given away and the bush came with it….Well, how could I resist?!! All I know is it’s an edible fruit bush and it has lovely reddish-green leaves. As it happens, I’m no longer keeping the planter but I love the idea of growing some fruit this year, so it stays. My mission is to identify the variety and get it out of the bin bag into a more suitable container very soon. 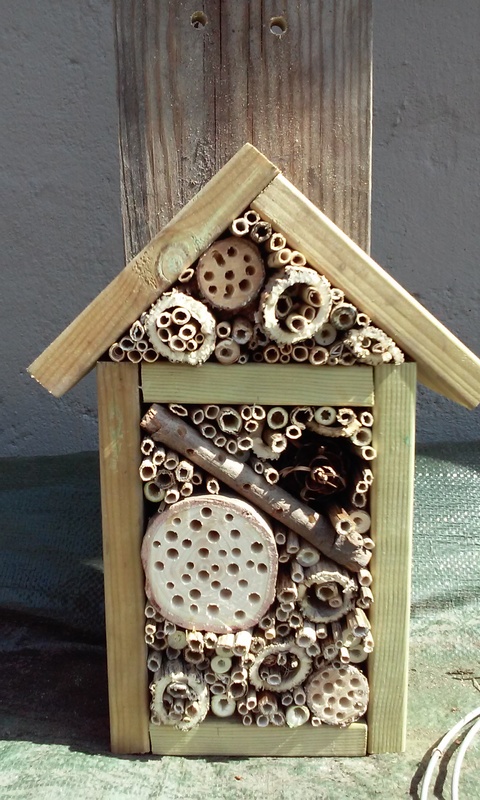 And finally, here is my finished Bee hotel. I want to add a little overhang to the roof to protect it from rain, as I have kept it rustic and haven’t cut all the tubes precisely to fit flush with the sides, but essentially it’s done and I’ll hang it up soon. I can’t wait to see if any guests visit it over the next few months. 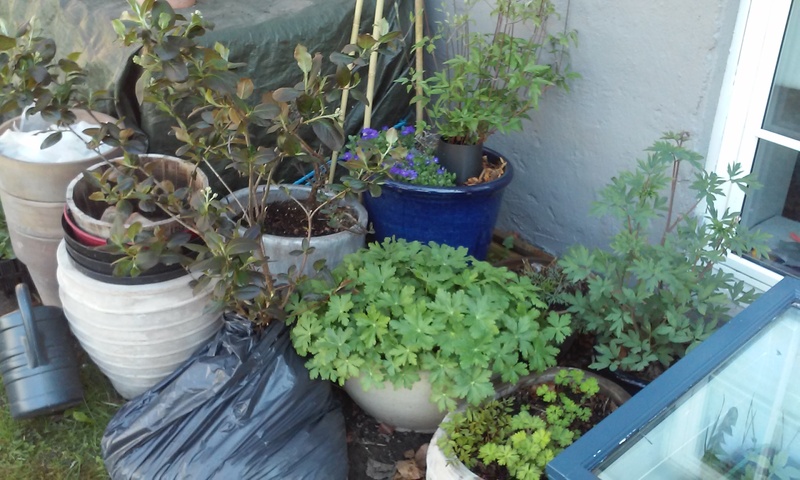 Categories: Monthly garden updates | Tags: bee hotel, hardening off | Permalink.